One of the major barriers to the gospel among Buddhist and animistic people of South East Asia is the misconception that Christianity is a foreign religion. It is often remarked that to be Cambodian is to be Buddhist, or to be Thai is to be Buddhist. This strong cultural and ethnic identification with Buddhism creates a problem for those considering the gospel. They may think that they have to reject their own identity and culture to follow Jesus. This misconceptions is one of the reasons that contextualizing the gospel is so important. The church in a Kuy village should look Kuy. It should have typically Kuy ways to gather, celebrate, communicate the good news and worship the Creator. 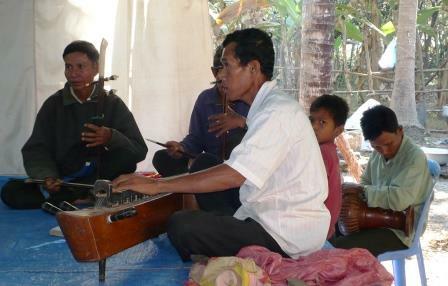 Let's pray again along with the Kuy church in Cambodia. Here are some of the key requests noted by our friends who asked their Christian Kuy friends what we could be praying for the Kuy in Cambodia. Pray that the Kuy people will come to know their Creator. Pray that they'll understand that Jesus is not a foreign god and that faith in Him is not just another religion. That God will produce a Church Planting Movement among the Kuy people of Cambodia, Laos and Thailand. For persons of peace in Kuy villages who will welcome the gospel and open doors. For partners to share in the work. For oral strategies to present the Gospel in Kuy. 16 Aug. 2010 More Baptized! 16 Jan 2010 Roads, What's the Big Deal?